There are a million ways to answer the question and to explain the reasons why people are doing karate. People tend to think that they are too old to start karate, others might picture karate as a violent sport filled with conflict and aggression. Nothing could be further from the truth, at least for true karate. There are seven reasons why everyone should practice karate or at least why they do practice karate! Self-Defence, Fitness, Confidence, Coordination, Focus, Discipline and Something Different. Let’s start with Self-Defence. Karate means EMPTY HAND. Many people relate to self-defence with different kind of weapons like guns, mace, pepper spray, screech alarms, 911, pens, fists, anything that is handy can be referred to as a self-defence tool. In karate your body is your weapon to protect yourself even when someone has a weapon in hand. Karate is the only self-defence tool that is always in hand, why because the only tools in karate are your hands and your feet. Since it is doubtful you will leave home without these you will always have them ready! Fitness is the second most frequent reason for practicing karate. 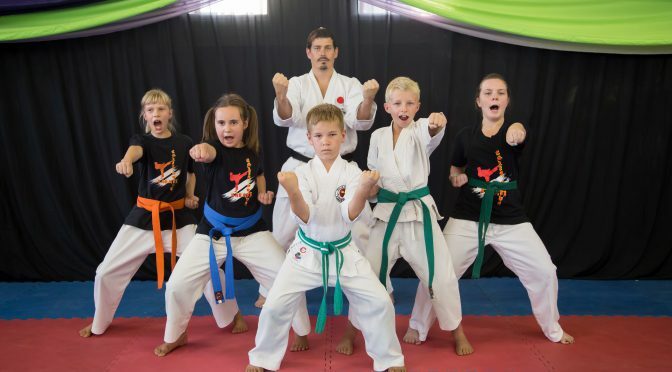 Karate training can be intense as an aerobics class by definition raising your heart rate to 70-80% capacity, however the beauty is that each student can advance at their own pace. You will always leave the Dojo drenched in your Gi (karate suit). Karate exercises your entire body allowing you to find muscles you didn’t know you had. Karate training will improve your stamina, strength, speed and flexibility. Because of the intensity of the training karate will improve your overall fitness and body awareness. Karate training will strengthen and develop almost every muscle in your body. Through proper dedicated training you can expect to reduce your resting heart rate and feel healthier. Coordination: Everything you practice in karate works on both your left and right brain. Karate uses all your senses and develops the student’s awareness of their body, how it functions and how to control it. This process leads to improving the coordination of the student. So why is this so important? Good coordination helps to build confidence and enhance a better performance in your karate style. Focus: This is a question often raised by parents and the reason why their children starts karate. To focus in karate does not necessarily mean to pay attention as in a classroom, but to focus your consciousness, mind and body on a single task. This requires the student to learn to block out distractions but still to be aware of their surroundings. This teaches them to only register what is important to their current focus. This is not to say that you should be ignorant to your surroundings, however that information should not distract you. Karate is a demanding discipline which requires proper focus to master yourself and the requirements of your training. Through karate training you will learn to focus and this is a powerful tool in all aspects of your life. Discipline: Karate is all about structure. The structure of karate is hierarchical, there is one head instructor (Sensei) with assistant instructors and then the students at various levels in the hierarchy. You cannot maintain structure without discipline. Only through discipline, trust, respect and structure can we learn to apply these same principles to our lives as self-discipline, confidence, self-respect, and control over ourselves. This is the importance of discipline. Something different: Karate can be an additional sport towards a sport you are currently doing. Karate can be a family sport, it doesn’t matter how old you are. Karate can be a lifestyle or can be competitive….your choice. Karate takes time, but so does anything that is worthwhile, fun, rewarding and challenging.